A 9-year-old boy’s mission to thank every police officer in America with a sweet treat brought him to Southwest Florida on Tuesday. They call him the “donut boy,” and he says police officers are his best friends. 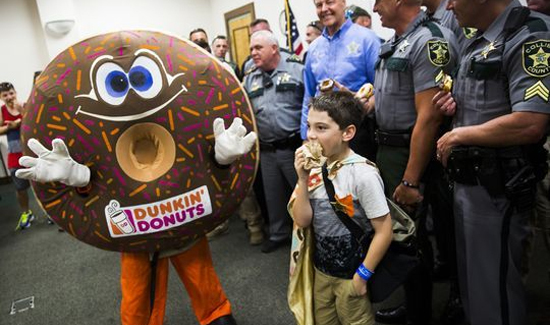 “They keep me safe,” Tyler Carach said, while wearing his signature doughnut-patterned cape. Tyler, a native of Bratt in the Panhandle, delivered 480 of the sweet treats to the Lee County Sheriff’s Office and another 480 to the Collier Sheriff’s Office. He posed for photos, sneaking bunny ears behind the officers’ heads, played tug-of-war with Saber, a Lee Sheriff’s Office K-9, and explored inside SWAT vehicles. “There’s a glow in his eyes, and you can tell that you’re making a difference in his life, and he’s also making one in yours,” Lee County Undersheriff Carmine Marceno said Tuesday. Tyler got the idea about a year ago when he saw four deputies at a convenience store. “Cops’ favorite drink is coffee and favorite food is doughnuts,” he told his mom, so he wanted to buy treats for the deputies with his own allowance money. And his mother, Sheena Carach, a former police officer, couldn’t say no. “I explained to him that cops were having a hard time and things were just kind of negative for them, so they could really use encouragement,” she recalled.